BETHESDA, MD – The Villages is the top-selling master-planned community (MPC) in the U.S. for the second straight year, based on total new homes sold in 2004, according to Robert Charles Lesser & Co., LLC, a leading independent real estate advisory firm. The Villages is an active adult community that markets to individuals 55 years of age and older. With 21,800 total acres, the developers do not expect to complete build-out until 2013. Master-planned communities are large-scale developments featuring a wide range of housing prices and styles, an array of amenities and multiple non-residential land uses (such as commercial, hotels and educational facilities) offering residents an attractive and convenient environment in which to live, work and play. Some communities provide lifestyle options for multiple market segments, while others target a specific buyer type such as active adults age 55 and over. Each year, RCLCo invites communities across the U.S. with gross sales of 300 homes or more to participate in the annual survey. 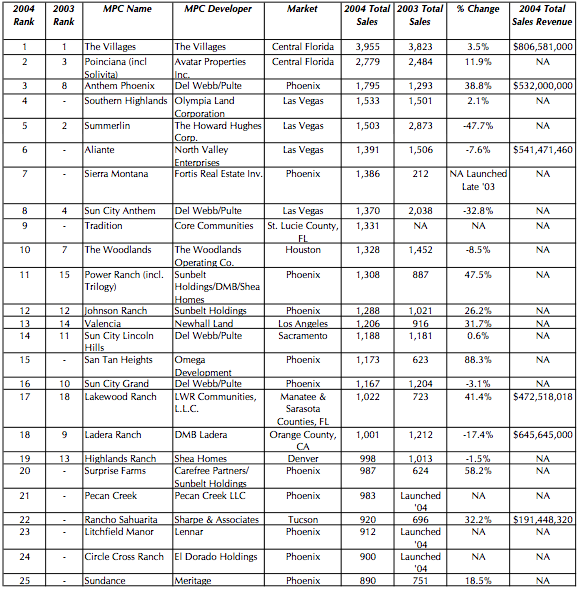 To compile the list, RCLCo examines historical rankings as well as new sales information. 2000 was the first year a significant number of master-planned communities sold over 700 homes, which motivated the firm to enlarge its annual list to 15 communities, up from its traditional top ten, and this year up from 20 to 25 due to an increasing response rate and enthusiasm about the list. This year also marks the first time RCLCo has reported revenue figures, to acknowledge communities selling higher priced products. For example, 18th-ranked Ladera Ranch had 80% of the revenues of top- ranked The Villages. Communities with more than 1,000 home sales dominate this year’s top 25 list. Fully 18 communities reported sales of over 1,000 homes – a remarkable number. Communities located in or near the markets of Phoenix and Las Vegas dominate the list, representing 15 of the top 25 developments. Del Webb, a brand of Pulte Homes, continues to have the largest number of communities on the list (four), including two of the top ten master-planned communities. Active Adult Communities targeting individuals 55 years of age and older continue to have a strong presence on the list. Six communities are solely active adult focused and an additional three feature at least one active adult village within the community. What is the formula for success? Most of these communities are in areas that are continuing to experience rapid population growth with steady, if not strong, employment growth, abundant housing options appealing to a wide range of consumers and large tracts of available land in desirable climates. All but three of the top-selling communities are located west of the Mississippi and the vast majority of them are located in the Sunbelt. Another significant factor is the number of retirees downsizing from their family homes into more age-friendly products. This trend is expected to increase as more of the Baby Boom generation reaches the prime retirement years over the next decade. On average, sales at communities that made the list in 2003 were up an average of nearly 15% in 2004. RCLCo has released its top MPC rankings since 1994, when it first undertook this effort in partnership with the Urban Land Institute to gain greater insight into the master-planned community industry.